As your child enters the school-age years, you actually need your support system more than ever. But that support system, is awfully quiet these days. The line between what's okay to share about your child — on the soccer field and on social media — and what definitely isn't seems to be much more drawn in the sand. So what's a Savvy Parent like you to do? Find a community of like-minded parents who are also trying to keep up with their kids' online use in positive, proactive ways. That's what the Savvy Parents Club is. Does your child like + follow any YouTubers? How is that going? Your child just asked for a phone. Use a GIF to show us how you feel. This is your space to connect with like-minded parents of school-age kids who are online now or will be soon, I can't wait to meet you. When you click that big yellow button, I'll send you your welcome gift AND your fast pass into the group right to your Inbox. I like to make things easy! Hi, I'm Galit, the host of The Savvy Parents Club. I give you the tools you need to let your child benefit from the amazing things the online world has to offer her and create a popsicle dripping, chapter book reading in one sitting, leaf crunching childhood that she deserves. • Because it's the fastest, easiest way to get in touch with me. • Because you get access to OTHER parents of school age kids who also want to teach their kids about the online world. 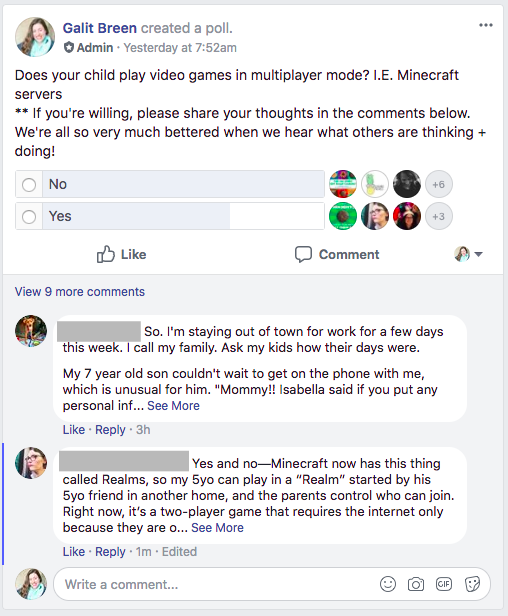 • Because it's not like every other conversation about kids online: I believe that you can let your child be online and still keep her safe. • Because I promise that you can let your child use screens AND create a grass-under-her-bare-feet childhood and this is where you + I can Coffee Talk about that. When you join the Savvy Parents Club, you’ll learn simple, creative ways to let your child use screens without all the crazy worrying. So if any of that sounds like fun to you (it is! ), what are you waiting for? Get in here! This is what The Savvy Parents Club is all about. The conversations about online safety and kindness you’ll have with your child are where the golden sparkles of change can shine. Education is your child's' path there. But it’s the conversations you’ll have with your peers that have the potential to be platinum. This is why I’m sharing a Parents of Tweens Manifesto with you as a welcome gift. Ten I wills that have nothing and everything to do with your child. “Nothing” because these points are focused on how you’ll treat other parents you know who have kids in a similar life stage as your mini-me. And “everything” because when you choose to be on the same team, everyone and everything wins. I will remember that we’re all learning. I will tell you what I learn. I will listen when you tell me what you know. I will look out for your child like I do my own. I will work with you to make sure that both of our kids are in a safe, kind online space. I will admit when I’m wrong. I will show you grace when you admit the same. I will hold my kids accountable for being kind to yours. I will remember that your kids are good as they’re learning the same. I will know—and act like I know—that we’re in this together. It doesn't really matter how you reach out to people, does it? The trick is to get into the habit of playing on the same team so that all of your kids—and you—can thrive within these tween years. And then to teach your child and her peers to watch out for each other, too. CLICK HERE to get that manifesto and group invite so that you can begin focusing on your tribe today!